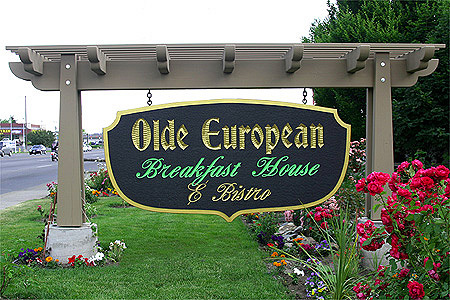 The Design Factory has been designing and crafting hand carved, routered and sandblasted wood signs for 24 years. 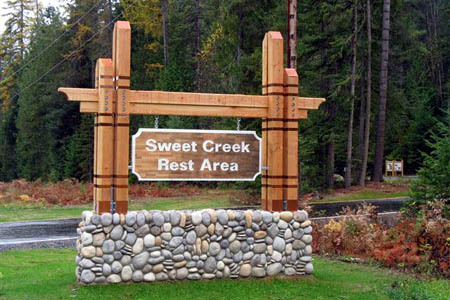 They have been made for subdivision entrances; restaurants; business; apartment and condo complexes; resorts; parks; ranches; highway rest stops; lake cabins and as decorative items. The Design Factory's clients have included city, county and state governments as well as private businesses. Clearheart vettical grain laminated western red cedar or genuine mahogany is used for almost all signs. Posts for signs are either pressure treated fir, hemlock, western cedar or steel depending on the design or client specifications. Concrete pads, footings and masonary structures are the responsibility of the client. However, The Design Factory can arrange for a sub- contractor. Our extensive wood and metal working backgrounds give us the ability to design, make and install complete sign mounting structures as well as the signs themselves. 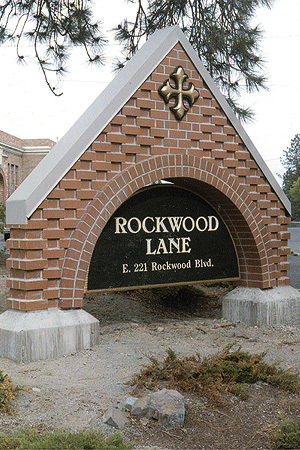 If you need a sign outside of the Spokane area sign packages are available as KITS complete with easy to understand instructions. Ken Kaiyala brings his manufacturing engineering experience and education as well as his work in all phases of construction to the manufacturing process. This in turn allows us to ship signs anywhere with confidence. We have successfully shipped signs to Washington, Idaho, Oregon and Hawaii. 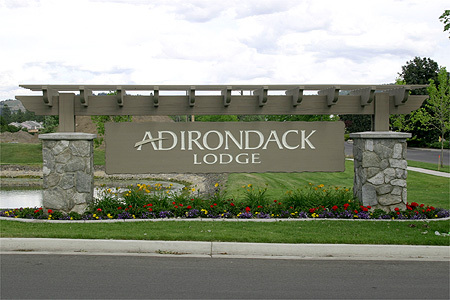 This architect designed sign is one of two manufactured and installed by The Design Factory. The sign itself is 2 3/4" thick laminated VG cedar with sandblasted cop on both sides. The structure is made from clear free of heart fir beams with copper bands in the recesses. The stone base was made by others. 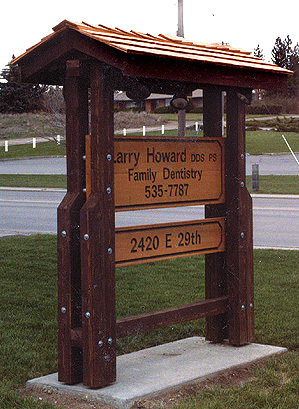 The sign blank is western red cedar and the shield is made from 2" thick high density urethane foam. The letters and lines are water jet cut out from 1/2" thick aliuminum and mounted 1/2" above the sign fact to cast shadows. The Design Factory designed all components and installed the completed sign. The construction of the masonary base and the cut out letters were jobbed out to local companys. 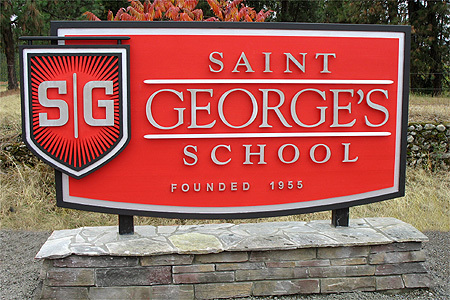 St. Georgers School sign is 2 3/4" thick x 42" high x 96" long. The sign blank is laminated genuine mahogany, posts and trellis are clear free of heart western red cedar. The sign itself is 2 3/4" thick, 48" high and 96" long. The 2 sided sign has hand carved incised copy, hand hewn edges and a raised steel "swoosh" as the cross stroke over the "A". The Design Factory designed all components using the clients Letterhead, cut, shaped, carved, painted, delivered and installed everything except the client subcontracted rock based. The sign itself is 3 3/4" thick, 30" high and 144" long. 1. The sign blank is laminated clear heart vertical grain western red cedar, the longitudinal beam is clear free of heart center western red cedar and posts and trellis pieces are clear western red cedar. The single sided sign has hand carved incised large copy with routered small copy. The sign edges are hand hewn. The Design Factory designed all components from the client's letterhead and cut shaped, carved, routered, painted, delivered and installed everything on the client subcontracted rock base. The sign itself is 3 3/4" thick, 30" high and 120" long. The sign blanks are clear laminated vertical grain western red cedar. All structure components are western red cedar dimensional lumber and the roof is covered with western red cedar shingles. The 2 sided signs have hand carved incised copy and borders. The design Factory designed all components, constructed the structure, stained all pieces and delivered and installed the assembly on the client sup[plied concrete pad. The signs themselves are 1 3/4" thick and 60" long. 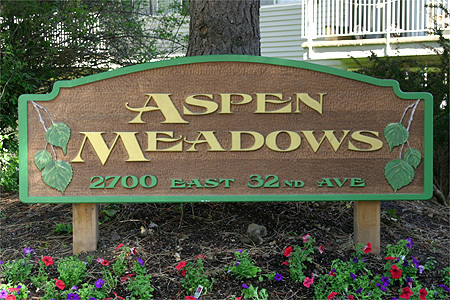 The sign blank is laminated genuine mahogany with cut out and applied high density urethane foam letters. Cut out sculpted and applied leaves and branches.The posts are pressure treated fir. The single sided sign has cut out and applied copy, border and leaves. 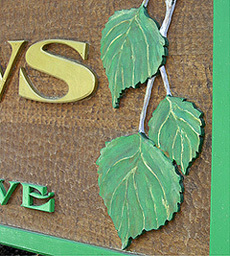 Leaves are made from high density urethane foam finished with artist's acrylic colors. See detail below. The Design Factory designed, cut, shaped, carved, textured the background, stained and painted all pieces, delivered and installed the finished sign. 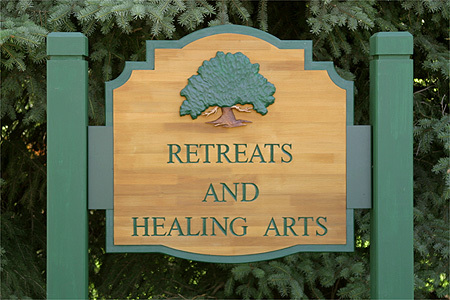 The sign blank is laminated clear heart vertical grain western red cedar, the posts are western red cedar and the mounting brackets are mild steel and the finish is artist's acrylic paints. The single sided sign has hand carved incised copy. router relieved border and cut out and sculpted logo. The Design Factory designed, cut out,routered, carved finished, delivered and installed a package of 5 signs for this client. See below for another in the series. The sign is 1 3/4" thick, 48" wide and 48" high, mounted between 5" X 5" posts. 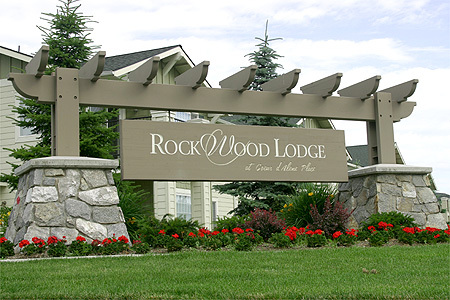 The sign blank is laminated clear heart vertical grain western red cedar, the applied pieces are high density urethane foam, the posts are western red cedar and the mounting brackets are western red cedar. The single sided sign has hand carved incised copy, router relieved border, cut out and applied site map and cut out and sculpted logo piece. The sign is 1 3/4" thick, 48" high and 72" long mounted between 5" X 5" posts. The sign blank and piece applied to the top of the brick is laminated clear heart vertical grain redwood. The single sided sign has hand carved incised copy and router relieved border. The applied piece is cut out and sculpted. 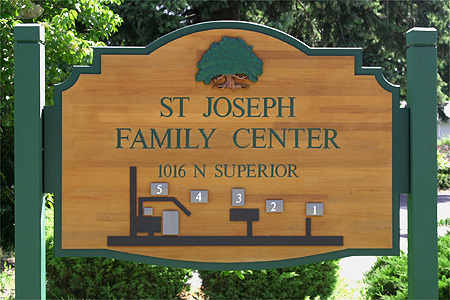 The Design Factory executed this architect designed wood sign. The brick work and installation was done by the client's contractor. The sign is 1 3/4" thick, 36" high and 72" wide.